Canadian Sergeant L.K. Woods (left) and Private M.S. 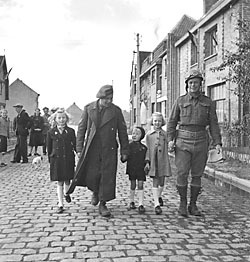 Perkins visit children in Furnes, Belgium, 1944. September 1944 is remembered as the month of Arnhem, the “bridge too far”, or by Canadians as the time of the battles for the Channel ports. But for the veterans of 4th Canadian Armoured Division, memories are of the rapid advance north, the liberation of western Belgium and the brief bloody struggles at the Gent and Leopold canals. On Sept. 6, the division was organized into two battle groups: Stewart Force and Moncel Force. The division was ordered to pursue the enemy to the area around the town of Eeklo, northwest of Gent. The corps armoured car regiment, the 12th Manitoba Dragoons, was to feel out the situation on the coast while the Polish Armd. Div. dealt with the eastern flank. The mood at divisional and corps headquarters was optimistic, even cocky. Antwerp had fallen to the British and what was left of the vaunted 15th German Army seemed to be caught with no way of escape. Army intelligence gleefully reported: “We have three divisions in the bag for sure and plus stragglers the total is now probably 50,000.” The war, many thought, could not last much longer. The apparent rout of the German armies in the aftermath of Normandy was bound to encourage this kind of optimism, but intelligence officers ought to have known better. At 1st Cdn. Army Headquarters, the mysterious group of air force and army officers known as the Signals Liaison Unit had received the Ultra decrypt of Hitler’s radio message ordering General Gustav von Zangen’s 15th Army to garrison the area north of the Leopold Canal, designated Scheldt Fortress South, and Walcheren Island, Scheldt Fortress North, to prevent the Allies from making use of the port of Antwerp. If the mouth of the Scheldt estuary was closed, Antwerp–60 miles inland–was of no value. Von Zangen was also ordered to withdraw the balance of his forces across the Scheldt estuary and bring them into action north of Antwerp. Lieutenant-Colonel Peter Wright, Canada’s senior intelligence officer, and a handful of others cleared to receive material from Bletchley Park’s code-breakers, discussed the situation with Gen. Harry Crerar. They agreed to warn commanders that there was evidence of strengthened German defences, but the rapid progress of the Manitoba Dragoons, who liberated Nieuport and Ostend and probed north to Zeebrugge, seems to have convinced them that despite Ultra the enemy was too disorganized to resist effectively. Reckless optimism was certainly the mood at Major-General Harry Foster’s divisional headquarters when orders were issued to seize a crossing of the Gent Canal at Moerbrugge. At the time, artillery was only available on call due to an ammunition shortage. It is also worth noting that there was no time for reconnaissance and that no assault boats were available. With Brigadier J.C. Jefferson in hospital, suffering from a recurrence of malaria, Lt.-Col. Dave Stewart of the Argyll and Sutherland Highlanders of Canada was in command and he selected his own battalion to make the crossing. The Argylls, one of the most consistently effective battalions in the Normandy battles, was busy enjoying Belgium where “people crowded the streets pressing bottles of champagne, cognac or best of all for the Canadians, Belgian beer upon the troops.” At the canal, two heavy, leaky boats, missing their oars were scrounged and Pete Mackenzie’s D Company went across in relays. They created a small bridgehead occupying several houses, but were held by the volume of fire and the first of what would prove to be many counterattacks. Charlie Company reinforced the position, but were soon cut off. The full story of this battle was finally told in Robert L. Fraser’s 1996 book, Black Yesterdays: The Argylls’ War. Major Bob Patterson of C Company recalled it this way: “I had 30 men and they were all there. You didn’t have to give any orders. They were all going to fight…. The most important person in the whole company was Company Sergeant Major George Mitchell…he was the most wonderful man I ever served with.” Mitchell’s “coolness and courage under fire” earned him the Distinguished Conduct Medal at Moerbrugge. His comrades thought it should have been the Victoria Cross. The struggle for Moerbrugge continued for three days, drawing in the Lincoln and Welland Regiment who put all four rifle companies across the canal to support the Argylls. Supplies were the real problem and the men carried double loads of ammunition into battle. On the morning of Sept. 10, the engineers completed a bridge. The tanks of the South Alberta Regiment joined the infantry and began flushing the enemy from houses and haystacks. The Germans quickly retreated, abandoning what they could not carry. Their task had been to delay the Canadians until the last units of the 15th Army got across the Leopold Canal. The battles for Moerbrugge and the resolute defence of the Channel ports ought to have warned corps and army that the situation was changing. The enemy, which had fled north in disarray in early September, was now fighting well-organized delay actions and preparing to defend a series of “fortress” positions. No one at the sharp end could doubt this, but senior intelligence officers and commanders were still convinced that the enemy was beaten and could not survive a determined attack either at Arnhem or the Leopold Canal. When Captain Ernie Sirluck, 4th Div.’s intelligence officer, reported that the enemy was holding the north bank of the canal in strength, he was ignored as was the detailed information from Ultra. Sirluck and the Argylls’ intelligence officer, Claude Bissell, would both have distinguished postwar careers as scholars and university presidents, but in 1944, reports from front-line intelligence officers carried little weight with operational commanders who were convinced the war was all but won. Moncel Force, or more exactly its infantry battalion the Algonquin Regt., was now required to attack across a double canal line near Moerkerke, Belgium. Here, the Leopold and Lys canals run side by side separated by a 60-foot-wide dike. Today, the road beside the canals carries the name Algonquinstraat. In 1944, this quiet country lane was the start-line for a battle that was to reveal just how committed the enemy was to the defence of the approaches to Antwerp. Shortly before midnight on Sept. 13, all four Algonquin rifle companies were ferried across the two canals despite heavy harassing fire. Able Company occupied the hamlet of Molentje, but increasing direct and indirect fire prevented the other companies from linking up. The Algonquins, with less than 250 men, were too thin on the ground and were forced on the defensive in three isolated pockets. The divisional engineers, 8th and 9th field squadrons, had to stop building a bridge when they came under small arms fire. At first light, the situation looked desperate. Artillery and mortar fire, which appeared to be directed from within Moerkerke, struck the engineers, battalion headquarters and the regimental aid post. The shelling became so intense and accurate that it was impossible to get ammunition to the rife companies across the canal. Lt.-Col. R.A. Bradburn, who feared his whole battalion might be lost, requested air support and an air supply drop, but nothing was available. At 1200 hours on Sept. 14, Moncel ordered a withdrawal. With the aid of a smokescreen and a divisional artillery shoot, which used up the remaining ammunition, the regiment withdrew by fighting its way through enemy troops who had infiltrated as far as the dike between the two canals. With most of the boats destroyed by shellfire, many of the men swam to the south bank. The Algonquins had 28 killed, 40 wounded and 66 taken prisoner. The German counterattack employed all available resources, but the Algonquins held. Their withdrawal took the Germans by surprise. They thought the curtain of fire brought down by the Canadian artillery was the prelude to a renewed assault. Neither side understood the position their opponent was in. 4th Div., with three badly understrength infantry battalions, could not sustain an advance against such odds. The Germans, already geared up for a major battle, would have 16 days to get ready because no Canadian infantry division was available. Montgomery’s focus was on Arnhem and so the south shore of the Scheldt would have to wait until 3rd Cdn. Infantry Div. had captured Boulogne and Calais. The immediate tasks of 4th Div. were to patrol the Leopold Canal and liberate the rest of western Flanders. The Canadian Grenadier Guards with the Lincoln and Welland Regt. on board led the way to Maldegem on the morning of Sept. 15. The enemy was gone and they continued east past open fields where one day the Commonwealth War Graves Commission would establish the Canadian military cemetery at Adagem. With bridges down, the Lincoln and Welland Regt. took over the advance, reaching the edge of Eeklo. Historian Geoff Hayes, who wrote a history of the Lincoln and Welland Regt., notes that the battalion reached Belgium with half its authorized combat strength and after Moerbrugge, B Company had just 19 riflemen. When eager Belgian resistance fighters urged an immediate attack on the departing enemy, Lt.-Col. Bill Cromb, who knew how tired the battalion was, replied: “That’s excellent. If we stop here and have breakfast, they will all be gone by the time we get in.” So the town Eeklo was liberated without a single casualty, soldier or civilian! The Germans were not yet ready to surrender the area north of Gent since they still needed the Port of Terneuzen to evacuate men across the Scheldt. The Polish Armd. Div., with even fewer infantry than the Canadians, were closing in on the port, but 4th Div. still had to clear its sector. Of the many war stories that remain untold, none is more important than the work of the Belgian resistance–the White Brigade–in assisting the Allies. Denis and Shelagh Whitaker have paid tribute to Eugene Colson and his men who secured the dock area in Antwerp and helped 4th Inf. Bde. hold the city, but in September and October 1944 almost every Canadian unit worked closely with Belgian patriots. During the advance north into Holland, these volunteers fought alongside the Canadians in some of the most difficult battles of the war. It is long past time we paid tribute to them. Indeed, Canadians who visit the Vimy Memorial would do well to turn their eyes north, not just to the World War I battlefields of Ypres and Passchendaele, but to the World War II battlefields, memorials and museums. If you were to start such a pilgrimage in Brugge, find your way to Canada Bridge where two magnificent bronze bisons, the symbol of the Manitoba Dragoons, commemorate the “memory of the Canadian forces who liberated the city.” You may also want to drive to Moerbrugge where the community unveiled an abstract sculpture made out of sections of a Sherman tank on the 50th anniversary of the battle. At Molentje, the small memorial plaque is barely noticeable, but each September a small grove of wooden crosses appears in memory of the individuals who lost their lives here. The Adegem Canadian War Cemetery is just a few miles away. It has the graves of 848 Canadian and 298 Polish and British soldiers. The town of Adegem features the superb Canada Museum, created by Gilbert van Landschoot who introduces visitors to the role Canadians had in the liberation of Belgium. He built the museum as a gift to the people of Canada because the rapid advance of the Canadians saved his father from arrest by the Gestapo. The displays relate the history of defeat, occupation and liberation of Belgium so that visitors may fully understand what men fought and died for. Perhaps the most impressive of all the memorials isn’t a monument or a museum but an annual event. Every Nov. 1, a Belgian-Dutch organizing committee plans an extraordinary Liberation March. 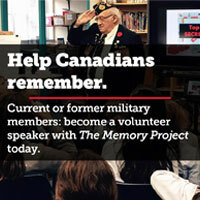 Over the years, veterans, serving members of the Canadian Forces stationed in Europe and thousands of ordinary Dutch and Belgian citizens and schoolchildren have participated. They walk with their national flags flying proudly beside the Canadian flag and learn the story of the liberation of their region. A story we need to tell to Canadians.